Feeling crafty? Go under the radar with a tightly focused guerilla marketing campaign. You don't need to spend thousands of dollars on print or video ads when you create and print your own custom Stickers. Take an edgier, grass roots approach to publicity. Once you've settled on your message, you've just got to know where to stick it. We'll show you how. Where can you advertise with Stickers? Pretty much anywhere! All you need is a smooth, flat, visible surface and you're good to go. Bulletin Boards and spaces designated for public messages are your guerilla marketing campaign's best friends! Many demographics look to bulletin boards for upcoming events, local attractions, and great deals. Most likely, you'll hit your target demographic, as well as some new, unlikely, and eager customers. Some areas allow stickers to be stuck directly to the bulletin boards, while others prefer to keep the boards clean for removable flyers and posters. If this is the case, securely pin your Stickers to the board. Interested consumers can take one and stick it wherever they want. What an easy way to deliver your stickers to your target market. Where can you find a huge, captive audience with time to read and consider your message? How about public transportation areas? Bus stops and train stations tend to be high traffic areas with great potential to reach your audience! According to the American Public Transportation Association, over 10 billion unlinked trips were taken in 2006: 58.8% by bus, 29.2% by heavy rail, and 12% for all other modes combined. That is a lot of people! Get your message to them! Take your Stickers to craft fairs, public celebrations and festivals, shopping malls, or other high-traffic areas. If you've created an appealing design, you can simply hand Stickers out to interested passers-by. Small children will be delighted to provide you with free ad space on their T-shirts, backpacks, or foreheads. Aim carefully. Before sticking that Sticker, take a step back and think about your target audience. Where will they most likely be? What will they be looking at? What is their primary form of transportation? In which direction should you shoot to hit that bull's eye? Achieve maximum impact by placing your Sticker in the correct locations. Want to advertise in public transportation areas? Take a look at American Public Transportation Association's statistics to help you determine what transportation areas to advertise in. Trying to get your message across to students? Take a quick survey to find out the professions of people reading the bulletin boards in different sections of town. With a just a little bit of research you can locate your target market and shoot with accuracy! Guerrilla marketing is unconventional. It involves creativity, advertising with a small budget, and reaching people in unexpected places. Just don't jeopardize your campaign by creating a public nuisance, alienating property owners, or vandalizing public space. Laws very from city to city, so you'll need to do specific research for your town, but here are a couple of general recommendations to help keep you out of unwanted sticky situations. Your marketing plan might involve placing Stickers in and on other people's buildings and businesses. This can be a great idea, but get permission! (In writing!) Civil lawsuits initiated by owners of private property you have defaced can eat up any money you save with a stealth campaign. If you have designed a beautiful and creative Sticker for a worthy cause, many business/property owners will be happy to allow you to place it on their property. The Axe Deodorant Sticker (right) is a perfect example of a great guerrilla marketing idea. 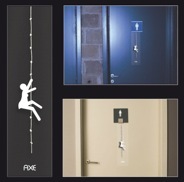 They have reached their audience in an unconventional and inexpensive manner, using only Stickers, bathroom signs, and permission from the people who own them. Since the sticker is unique and comical, business/property owners are easily persuaded to allow Axe to put them up. However, never assume anyone is OK with you advertising on their property. Always get permission. Stay clear of criminal charges for vandalism and defacing public property. City walls, benches, light posts, etc, can all be great, unique spots for your Stickers! However, get approval (in writing) from the city before you stick your Stickers on their property. Different cities have different laws. Some cities require you to obtain a permit before advertising. Just play it safe. Before you stick, check every resource available. Odds are, permission will be granted and you will be off and running, placing your custom Stickers everywhere and reaching your target audience in your own unique way! Guerilla marketing is all about being creative and unconventional. If you're not having fun, it's not going to work. If you are having fun, you can reach people in unexpected ways, stand out, and be remembered by your customers. So get out there and start sticking! Your Stickers are not going to hit the bull's eye by themselves!